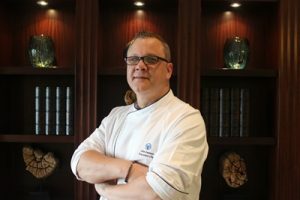 Alan Snyman, has been appointed as Executive Chef at Amwaj Rotana, Jumeirah Beach Residence, Dubai. Not a stranger to the Rotana brand, Alan has worked in various hotels with the group in the capacity of Executive Chef in the region in locations such as Sharm El Sheikh, Abu Dhabi as well as Dubai where he has also previously been Executive Chef in Amwaj Rotana from 2012 to 2014. Holding a certification in professional cookery from Staffords Cookery School in Cape Town, South Africa, Alan began his career as an apprentice Commis Chef at Champers Restaurant in Cape Town as well. Alan brings with him over 24 years of experience in the culinary field, having worked in the South African region and Ireland before crossing over to Middle East, where he started as an Executive Sous Chef at the Jeddah Hilton Hotel and Qasr Al Sharq, a Waldorf Astoria Collection hotel in Saudi Arabia. In his new position, Alan will oversee all of Amwaj Rotana’s kitchens consisting of five signature restaurants including the famous American-Japanese Teppanyaki chain, Benihana, a 24-hour room service operation and an extensive banqueting and private catering unit.